In the picture above, you can see one side of checker board. Polished well in black and brown color. This checker board can also use as chess board. They have same square, same color, same amount of squares and same flat. The different one is the pieces which stand on it and the game rule. This giant board is made of high quality Teak wood, so it is very durable. You can put it at your garden or your yard for years. You do not need to worry about the damage because we prepare the product for outdoors use. 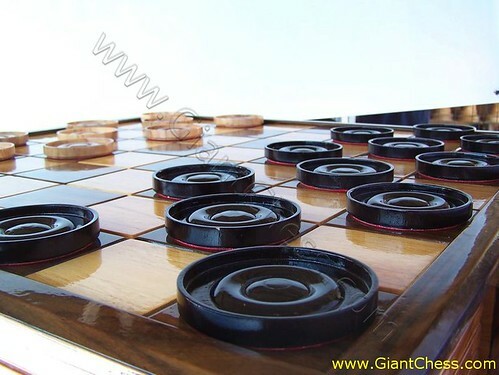 We have choose the best quality Teak wood as main material, so it will be safe for you to take it for outdoors use, such as parties, decoration, checker or chess games, photo section or another activity.